Should President Muhammadu Buhari stop blaming the nation’s woes on his predecessor? Vice President Yemi Osinbajo has a contrary opinion. He believes that failure to dig up corruption will have dire consequences in the future. 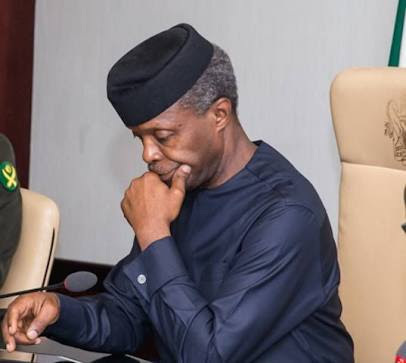 In his remarks at the seventh Presidential Quarterly Business Forum (QBF), Prof Osinbajo says there must a clean break from the corrupt past to get Nigeria on the part of greatness. Before I go into my few remarks, I just want to add to some of the questions that have been asked. A question was asked on the railways and what has been happening especially with respect to being able to evacuate goods from the ports. Two things happening; first, I’m sure some are already familiar with the concession given to General Electric (GE), to refurbish the Narrow Gauge Lines, which starts from the Ports itself. That concession is already in place, and we expect that things should begin to happen very quickly. Also in the private sector, one of the members of that consortium – APM Terminal, is going to do something on a railway station on the way to Ibadan and trying to develop an inland port there. They say they can do this in 10 weeks and we hope that means a further reduction in the pressure on Apapa Port. Asides from that, the Standard Gauge Line, which is funded by the China EximBank has already started and taking off from the Apapa Port. We expect that by the end of this year, we should see significant progress between the Lagos-Ibadan end of that Standard Gauge Line. As a matter of fact, our target is to have that bit of it concluded by the end of this year and we hope we can achieve that. So, that would move goods from the Apapa Port out of Lagos to at least as far as Ibadan, before going to Kano which is the terminal point of the Standard Gauge Line. The other question I would like to add to is concerning the Eastern ports, because someone asked about the Onitsha Port. The concession agreements on that have been finalised; all the technical evaluations have been done, it is going to the Attorney-General’s Office and we expect that it should be sorted out very shortly. In that same Eastern Port axis, there is a Warri Port, the technical evaluation is still going on, it hasn’t been concluded yet but we expect that it should move on very quickly. The other point is the frustration that many of us feel when we come into Nigeria through our airports and of course, some of the frustrations around the seaports in bringing in goods. The point that was made especially about two people sitting together, questioning you and passing your passport from one person to the other, is what we are all generally irritated about. What we require is i-check, which is quite an elaborate device which enables us to get advance passenger information ahead of passengers arriving at the ports. This enables us to do two things – one, it enables us to give visas on arrival because you already have the information of the passenger. Secondly, it removes the necessity of more than one person checking the passport because you already have advance information, the other security person works from the backend. We expect that when that is installed, we would be able to achieve that and remove the nuisance of two/three people checking passports. Last week, we held a meeting with all the agencies that are usually at the ports, and you find that there are several of them. The idea is to reduce this number and ensure only those who must absolutely be there are there. There are some who don’t need to be there but rather be summoned when their services are required. The permanent solution we are proposing for bringing in and taking out goods from our ports is through our single window, the National Trading Platform. We have gone very far with that, and we expect that should be on stream very shortly. We are at the point where this is going to FEC for a final approval. With the single window, a lot of the stress will be greatly reduced, and with the appropriate scanners run by concessions with Public-Private Partnership (PPP) arrangements, we should be able to achieve greater ease of coming into our ports and exporting goods from there. Let me join my cabinet colleagues in thanking you for making the time yet again to attend the Quarterly Business Forum (QBF). This is the seventh forum, and there are many here who have attended all seven. To them, we are of course, especially indebted for their consistent faith and support for this process; even those who haven’t attended seven, have attended several and there are some who are attending for the first time. It is important that we continue to emphasize that for us both philosophically and as a practical matter, our partnership with the private sector is fundamental. Aside from the QBF, we have established other platforms to harness the partnership. These include the Industrial Policy & Competitiveness Advisory Council and the Presidential Enabling Business Environment Council. These are interactive platforms where we bring the private sector to collaborate, develop and think through policies with us and in the Competiveness Council to even implement policies with us. I think this is the way we ought and have to continue because when you consider the size of the Federal Government’s budget, and even when you total the aggregate states’ government budget, you find that the absolute amounts are very small indeed. But, once you factor in the private sector, that becomes the real economy of Nigeria and there is no way of talking about the economic development of Nigeria without the private sector seating at the table, playing a critical role. I have asked the question, and I ask again? What was wrong with the Nigerian economy and what did we need to do to correct the flaws? Corruption at the root of it all There are several issues, many of which have been well articulated in all earlier presentations. But I want to talk about what I think is probably the biggest problem but which we, for some reason, hardly talk about when discussing our national economy. This is grand corruption in the public finance space! Sometimes, the way we talk about the Nigerian economy, it appears like it is the economy of say Norway or Sweden, where all things are equal. Even when we refer to what has taken place in our economy, we almost sound as if this is a normal business environment, a normal public finance environment but that is not the case. I don’t think that any considerations of our economic development can be properly or honestly done without fully analysing the role of grand corruption in the public finance space. So, despite record high levels of oil prices, very little was invested in infrastructure and record levels of leakages were recorded, especially in the past few years. This is the fundamental issue in our economy. Corruption affects everything, it even affects judgement as to what sort of infrastructure to put in place or whether to even put infrastructure in place or whether it would be completed. It is so fundamental that we cannot even think of our economy, without thinking of what to do about it. Sometimes, when we talk about our economy, we say that we have relied on a single commodity, and that is one of the reasons we are where we are. Yes, that is true. But, it is a fact that the proceeds of that single commodity were regularly hijacked consistently by a few. That is really the problem. If we spend the proceeds of that single commodity the way we ought to spend it, we won’t be where we are today. But, most of the proceeds go to rent seekers, who invest little in industry and production. I’m sure many of us are familiar with the so-called strategic alliance contracts with the Nigerian National Petroleum Corporation (NNPC) and Nigerian Petroleum Development Company (NDPC), the promoters of the companies made away with close to $3 billion, almost a tenth of our reserves at one point! There is no way if someone made away with that amount, a tenth of your reserves, that there won’t be a major economic shock! If we don’t deal with it and talk about it, how do we really discuss our economy in any real honest way with a view to ensuring that these things do not happen again? In one single transaction, a few weeks to the elections in 2015, the sum of N100 billion and $289 million in cash were embezzled by a few. When you consider that in 2014, when oil prices were an average of $110 per barrel, only N99 billion was spent on power, works and housing. And in one day, N100 billion was issued and people essentially shared it and N99 billion was spent on power, works and housing. When we talk about our economy, we talk about it like it is normal but it is abnormal by every standard, completely abnormal. Nobody should talk about the economy when you have these huge leakage and corruption; corruption that makes what you allocate to capital and infrastructure nonsense. From the presentation of minister of Finance, N14 billion was spent on agriculture in 2014 and transportation (N15 billion). The total spent on capital in those critical areas was N153 billion and in two weeks to the 2015 election, N150 billion was shared and essentially shared! So, if your total capital spending is N150 billion and you can share N153 billion, let’s face it, that is completely incredible! It is the sort of thing that doesn’t happen anywhere else in the world. When we talk about the economy, we absolutely must understand that is the problem. Today, with less revenue, we have increased capital funding by 400 per cent in power, works and housing, defence, transportation and agriculture. Economic analysis in Nigeria is either fraudulent or ignorant if we do not bring the money lost to corruption into the maths. This is what distinguishes this administration from any other. It is the fight against corruption especially in public finance. And I can say that will all sense of responsibility, if you have a President who is not corrupt, at least 50 percent of your financial problems, especially in public finance, is over. This is what I have seen, and I can prove it with facts and figures. If the President is corrupt, the entire financial system of the country is compromised, that is what we have seen from the figures. That is an absolute important point that we must take into account. I am not saying that corruption under this administration has been completely dealt with, certainly not. Where corruption has become systematic, you can’t deal with it all in one fell swoop. In any event, you still have to deal with corruption fighting back, the system fights back, it is both an internal and external fight, and you have to be steadfast and strategic to win the battle. There is no way you have a system that has consistently thrived on corruption and proceeds of corruption and public finance in particular that will just roll over, no! It is a system that had actively dwelt on corruption and the system affects all aspects of governance. So, clearly trying to deal with it is not a walk in the park. I want to say that task has already begun and being done consistently, I believe that going forward in the next few years, no matter how we slice it, if we stick to policies, especially in controlling excesses and corruption in public finance, this country will make the kind of progress it deserves to make with all of the resources at our disposal. If we stick to a policy that ensures that as far as public finance is concerned, there is no impunity, and we hold people to account, I am absolutely confident this country has everything it takes to make the sort of progress that we deserve to make as a nation. Again, let me thank everyone for your participation and continued support and confidence in the work we are doing. I want to say all the comments and issues are taken seriously. We will go back, and look at what we need to do to ensure that all our objectives, plans and thoughts come to fruition, and that our country becomes a better place for doing business and the economy of our country grows to the benefit of our people.